Having visited Mother Shipton's Cave and been persuaded to return on the other side of the river, I made the glorious walk along Waterside and fancied a pint when I got back to the road again. Since the bus stop I needed was just past the entrance to MSC, I popped in to the World's End. It was 4.30 on Friday afternoon and I appeared to be the only customer (although there were a few out of sight). Nice olde worlde pub with a friendly young chap behind the bar who informed me that Daleside Blonde was the only beer on handpump which he said was very good. Ordered a pint and it certainly was and in very good order. Had a very pleasant chat about music and a small crowd came in just as I was about to finish my pint and head off to catch the bus to Harrogate. Certainly worth a visit. This is a Pub with a lot of potential which is not being achieved, the place stinks of chip fat, we order sandwiches as I wouldn't risk anything else, the bread was dry not very appetizing. The chips were excellent, not much you can do to ruin chips. Think they must rely on bed race day for the yearly takings. Heaving in there on first visit and two Daleside beers were going down well. Went back recently and there were half a dozen customers there on a Saturday night. One cream flow Daleside beer and 10pm closing time. The Half Moon has show what canbe done with a pub to bring in trade. This place should be equally busy but it really needs some TLC. 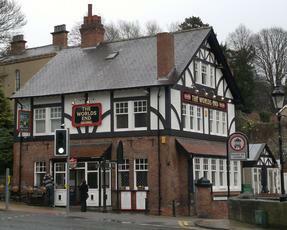 this pub could be lovely and should be for the place it is next to mother shiptons cave. It could have loads of visitors but the standard of food was awful when I visited this week. I ordered pate- no pate, asked for the sausages special- no sausages so ordered for my partner ham egg and chips, the ham was boiled ham heated and my ploughmans think they just emptied the fridge and the bread was stale!!! I felt embarassed as the bar man was so positive. The pub could be a good earner but please improve your food, clean the toilets and get rid of the smell of the chip pan that lingers. good luck to you because you were just so friendly it was a shame.